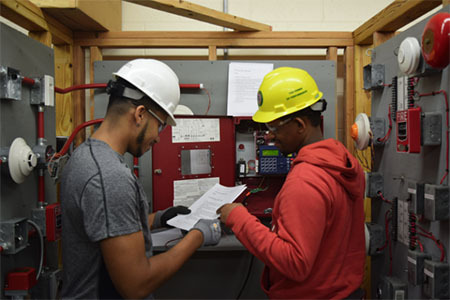 The IBEW Local 103 Joint Apprentice and Training Fund (JATC) recognizes that substance abuse exists in the Apprentice Training Program (Program) and in the trade. Substance abuse and impairment compromise workplace safety. This Policy is intended to eradicate substance abuse in the Program, and to provide apprentices with the opportunity to receive help necessary to become healthy, productive and safe journey workers. The JATC has a zero-tolerance policy for drug use. Drug and alcohol use will not be tolerated on the job or at school. Admission to the Program is conditioned upon the applicant’s successful completion of a drug test. An applicant’s conditional acceptance into the Program shall be immediately withdrawn upon failure to pass the scheduled drug test. Any apprentice found using, distributing, selling or in possession of alcoholic beverages and/or drugs on any training site or at the workplace is subject to immediate termination from the Program. All apprentices are subject to random drug testing. Apprentices who fail a drug test during their probationary period shall be terminated from the Program. Apprentices who fail a drug test following completion of their probationary period shall be subject to discipline, up to and including immediate termination from the Program. Apprentices who receive discipline other than termination will be referred to Modern Assistance Program. The Director and Assistant Directors reserve the right to drug test, or refer to Modern Assistance Program, any apprentice they believe has violated this Policy. Apprentices who fail to comply with the treatment recommendations of Modern Assistance Program shall be subject to additional discipline, up to and including immediate termination from the Program. Apprentices are required to disclose their use of any prescription medications to Modern Assistance Program. Failure to do so may result in immediate termination from the Program. The JATC reserves the right to take disciplinary action, up to and including immediate termination from the Program, against any apprentice who it determines in its sole discretion has failed to fulfill the requirements of this Policy, or any other drug and alcohol policy sanctioned by IBEW Local 103.